About The Foundation - KINDAH FOUNDATION, INC.
Kindah Foundation, Inc., is one of the leading 501(c)(3) in Florida advancing the cause for women with Gynecologic Cancer. We are passionate about eradicating and breaking the silence of cervical and ovarian cancer locally and aboard one female at a time through educational outreach, awareness, and survivors support services. We believe no female should ever die from preventable cancer. On September 24, 2016, the launch of South Florida’s first-ever “5K run/ walk” dedicated to the Ovarian & Gynecologic Cancer community. Since the launch, we receive proclamations from Broward County, the City of Pembroke Pines, and the town of Davie in support of our efforts to raise awareness on these deadly diseases. The ultimate goal of Kindah Foundation is inspiring hope, empowering change, and to help save lives. Local Impact, National Influence, Global Reach. EDUCATION: Host annual workshops to inform the community especially those in high schools, colleges, and universities about the warning signs and symptoms of Ovarian Cancer, Cervical Cancer and the risk factors associated with HPV and PCOS. 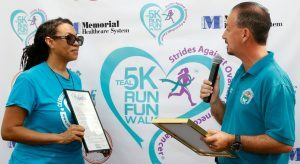 AWARENESS: Promote early detection and prevention of Ovarian and Cervical Cancer through our annual Florida Teal 5K Run/ Fun Walk™ and Teal Affair Charity events. SURVIVORS SUPPORT SERVICES: Assist gynecologic cancer patients with co-payment, necessary prescription, transportation, meals, wigs, etc. Also, each gynecologic cancer patient that is currently receiving treatment receives a “We Care Teal Kit” while they’re in treatment to help comfort their healing process. The key to early diagnosis is AWARENESS. No female should face gynecologic cancer alone. You can make difference!